Squeeze the lemon. Peel the figs, leaving some skin. Put them with the lemon juice in a food processor; chop coarsely. Stir in the sugar and cream. 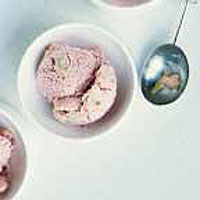 Freeze in a shallow container, stirring every ½ hour or so, until softly frozen.